Last week, we reported that the iPhone Upgrade Program caused frustration for some customers attempting to pre-order an iPhone 7 or iPhone 7 Plus. Specifically, some customers enrolled in the program were unable to select the model, carrier, color, or storage capacity they desired, or any iPhone in some cases, due to limited stock seemingly as soon as pre-orders began. The underlying reason appears to be that iPhone Upgrade Program members were placed into a separate stream than regular pre-order customers, and forced to reserve a new iPhone from a local Apple retail store -- many of which were sold out. Some customers were not even able to access the reservation system at all. Since then, it appears that Apple has acknowledged those concerns and is attempting to help make the situation right for those affected. 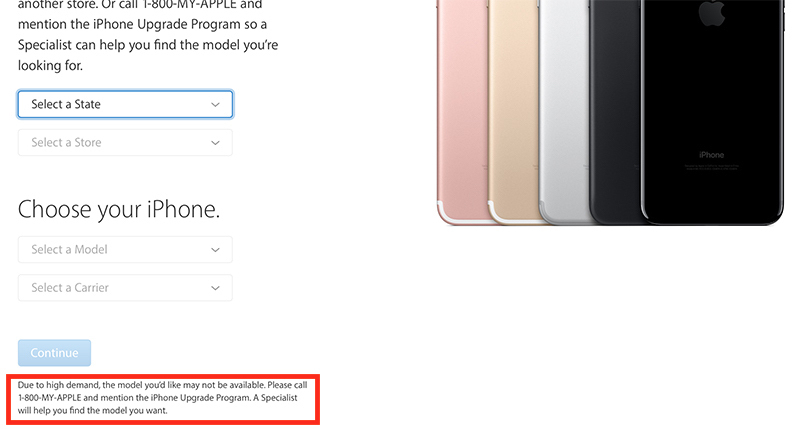 Over the weekend, Apple updated its upgrade reservation page with fine print that recommends customers call its support team at 1-800-MY-APPLE and mention the iPhone Upgrade Program. By doing so, the company said a Specialist will help customers find the iPhone 7 or iPhone 7 Plus model they want. Due to high demand, the model you’d like may not be available. Please call 1-800-MY-APPLE and mention the iPhone Upgrade Program. A Specialist will help you find the model you want. A number of MacRumors readers that followed through with calls said Apple was very apologetic and is manually collecting information while it works on a solution. Each customer was told they would receive a phone call back within 24-48 hours, but it isn't entirely clear what action Apple plans to take. The guy I talked to apologized profusely for Apple dropping the ball on this, took all my info regarding what model I wanted, and while he didn't promise anything, said they are working on a solution for it. He said they will call me within two business days with more information and sent me his direct contact info should I have questions. The whole call took about 30 minutes. Some customers were given the impression that Apple will be prioritizing orders for iPhone Upgrade Program customers, possibly with some in-store stock reserved specifically for upgraders on launch day and possibly afterwards. They've said that they are looking to prioritize iPhone Upgrade Program upgrades over the next couple of weeks so that we can get our phones. I highly suggest anyone who had the same issues I had to call and ask to speak to someone in the iPhone Upgrade Program department. They transfer you to a special group who will take down all your info and what iPhone you want. They say they will then be in touch in 48 hours letting you know when your iPhone can be picked up. They told me they were very sorry that iPhone Upgrade Program users had issues and that they weren't prepared and are trying to make it right. They said their goal is to have iPhones ready for pickup on launch day for Upgrade Program users who call in. Whether those enrolled in the iPhone Upgrade Program receive their new iPhones on launch day remains to be seen, but it is clear that Apple is doing what it can to improve the situation. In the meantime, customers can try their luck at Apple retail stores on September 16 on a first come, first served basis. I know it's not ideal and quite a few customers got burned (not literally, like the Note users), but I'm pleased to hear that Apple are trying their best to resolve the situation. Can someone direct me to the part in the iPhone Upgrade Program where it says you get PRIORITY treatment over other customers? I don't recall it being there. Such a non-issue (unless I'm mistaken and it DID say that)? No one says we should get priority. But when I tried to preorder 5 seconds after the apple store app was up all phones were sold out and you couldn't make a reservation,while there was no issue to purchase a phone if you are not part of the Apple Upgrade program. The point is that the Upgrade Program customers got much worse treatment than the normal customer - no option to choose a new phone for shipping, so limited to stock on hand at store at best. I'm pretty most people on the program are just looking to have the SAME priority as others. I got my 7 Plus with the program, and certainly expect to be able to order the 8 Plus just like everyone else next year. It isn't about priority. This program is designed so you always have the newest iPhone, therefore apple should know who all is available to upgrade in the month of the new release and there should be devices set-aside for these customers every year. How about they release pre-orders for upgrade plan users a day early...pretty sure that would be motivation for a lot more customers to sign up for this program. Last week, on a whim, I had sent an email to Tim Cook about this issue and my experience. I just received a call from someone on the leadership team who got all my info, apologized about the issue and said they were working to make it right. He asked for a lot of information about my experience, what happened with the pre-order, what has happened since, etc. He said a brief was being prepared for Tim and the entire leadership team about the issue. He appreciated my comments and got all my information and said he would be back in contact with me. The AUP has no wording in it that states that participants can pre order a new model phone the moment pre orders go live. It's a program designed to allow users to get a new phone, in the store, WHEN ITS AVAILABLE. I think there is a lot of misunderstanding and impatience here. AUP participants will get a new phone.... just not immediately. New thread, new wave of people that don't really understand what's going on. So let me try to summarize. * This is for people who signed up for the IUP last year and are trying to upgrade this year. * We're supposed to be able to upgrade after 12 months. Phil Schiller talked this up during the iPhone 7 announcement. Before everything went bad the Apple IUP page was still saying "First to join, first to upgrade." * And most importantly, this isn't about having to wait. Many of us could not even place an order. There were few to no phones available in the separate ordering system we had to use. It's not that we placed an order and are unhappy that we'll have to wait until after release day. We could not and still can't place an order. We can speculate on the nature of the system or planning failure that caused this, at the moment we don't really know. But that's why Apple is now having people call, they are gathering info and trying to figure out what they can do about all these upgrade customers that couldn't, and still can't, upgrade. * If we can't upgrade at 12 months, well will have to make extra payments on the current phone and extra payments on the next phone (or upgrade late). * Nothing in the contract would have lead us to believe we'd have to do the upgrade in store, in fact the language in the contract indicates we'd have 14 days to send in the old phone after receiving the new one. The contract was clearly written with the idea that the upgrade would, or at least could, be done by mail. * And finally, from the other thread, if you had this problem you need to call (not chat) to get help, and it's clear at least half of the front line Apple Support people are still clueless. Insist on talking to an iPhone Upgrade Program Specialist, as instructed on the web page. If they won't transfer you, hang up and call back. In my case, I got into the store at about 12:03 and there were no phones available. There haven't been since. We watched everyone else ordering, and ship times slipping into October and November, and we couldn't (and still can't) place an order. Nice for those that are in the program, but, I don't feel that it should have priority over those users who opt to buy unlocked versions. I don't think you understand that we don't expect priority. We expect *the same* as you'd get by ordering the phone for purchase. Problem is that there was still vast inventory for purchase available for you, and no inventory for purchase for us. I feel like the whole issue can be resolved if IUP customers are allowed to get the phones shipped to their homes with instructions on how to trade in/activate the new phone. One other note about the IUP in case it's still not clear for some. There is one and only one reason that we all enrolled in the IUP: to UPGRADE each and every year. As has been stated in this and other threads, marketing materials (perhaps in the past) said, and Phil said, "be the first to upgrade...". There is no financial incentive, since there are other ways to finance the phone purchase, even from Apple. This program was to lock people into purchasing a phone (from Apple), and being able to get another one the next year and only pay 12 payments, and 'get out of' the remaining 12 payments on the original loan. Anything that prevents that is not what was sold to us by Apple last year, and, from how Apple is reacting to the supply issue, they agree. All these comments about 'whining' and 'priority' need to be looked at in the context of how the program was sold a year ago. I don't particular care if I get my replacement/upgraded phone on Day 1, but I better get it the first two or three weeks to not have to pay a 13th payment. Apple just called me and said that there will be a black iPhone 7+ waiting for me to pick up on Friday morning.